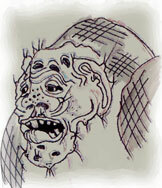 These mythical monsters are generally described as being very large, ugly and beast-like. They are also not known for displaying very much intelligence. They often have features such as horns, warts, hairy skin, long arms and humpbacks. These beasts also have disfigured faces with oversized noses, distorted eyes, deformed teeth and huge ears. These monsters are not usually depicted as being very friendly – in fact, they are often described as cannibals and man-eaters. In fairytales, they are known to intercept and block the passages for travelers and cause many to perish without reaching their journey’s end. They sometimes live together, usually in parent and child groupings. It is also said that they come out mostly at night in the search of food and water. Any exposure to sunlight can turn then to stone. Some Scandinavian stone landmarks are said to have been formed by some of these giants who dared to venture out in daylight. Here is some more gameplay to watch featuring - The Frost Troll.